Female Evening Grosbeak – Coccothraustes vespertinus. Last weekend I journeyed to the Sawtooth National Forest in Southern Idaho. I was focused on recording the “South Hills” subspecies of the Red Crossbill. Due to the absence of Red Squirrel in the South Hills, the Lodgepole Pine of that area are absent of a seed predator, save the Red Crossbill. As such, the Red Crossbill have a steady food supply throughout the year, causing them to be resident rather than the typical seasonal nomadism of other Red Crossbills. The relationship with the Lodgepole Pine has become an arms race of sorts, where tree and bird are adapting one after another to overcome the each others adaptive advantage. This in turn has shaped the morphology of the crossbills. They are now distinct in morphological characters such as bill shape, but they are also distinct in call type which is likely a result of their long isolation from other crossbill populations. Thus is the reason for my interest in obtaining an audio recording. For a more complete story about the “South Hills” Red Crossbill (Type 9), see Benkman et al. 2009. This is all in depth (and perhaps unnecessary) background to why I ventured to the South Hills. Regardless, I spent hours searching all areas that I was able, but to no avail. I couldn’t find the crossbills. Some roads were not open due to remaining snow, so my ability to search was limited. Still, I was disappointed. The birding was good nonetheless. So much so, in fact, that I was able to find another project to augment the absence of the Crossbills. I found a small flock of Evening Grosbeak, a nomadic mountain dwelling finch that one does not happen upon enough. The grosbeaks were vocal, so I took the opportunity to record their calls. After all, I didn’t want to leave empty handed. I’m happy I did, because after some research I’ve discovered that the Evening Grosbeaks are like the Red Crossbill, as they too have a number of distinct call types that correspond to particular groups. At the moment there are 4 recognized types. 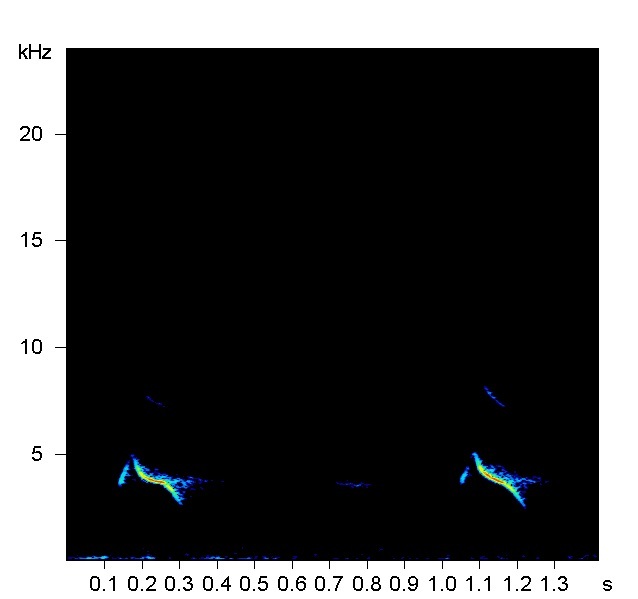 From the spectrograms of this series of calls, I was able to identify the call type for this group, which corresponds to geographical origin and even perhaps subspecies (Sewall et al. 2004). The call type for these birds is Type 1 as we would expect in this area. Type 1 is a group that inhabits the northwestern portion of the range of the Evening Grosbeak. Below I’ve presented the first spectrogram of an identifiable call note in black and white, followed by a colored spectrogram. I couldn’t decide which was more attractive. Forgive the formatting of the spectrograms as well, I’m just starting to get a hang of how to produce these images. Figure 1. Two call notes given by an Evening Grosbeak. Time is shown on the x-axis in seconds, and frequency is shown on the y-axis in kHz. The call note on the left is the typical sweep call not unlike the flight call. This is the signature referred to as Type 1. The second call is a broad-band fluttered call. 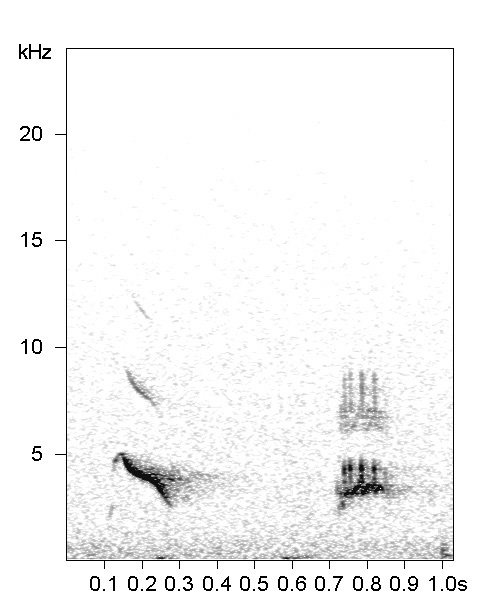 This particular bird was giving paired calls most often as illustrated, but at times calls were paired as two sweep calls (figure 2). Note the fundamental (darkest) with the first harmonic above each call. Figure 1 shows a paired call, where the second call is quite different. The bird I was recording was repeating this sequence. I’ll need to research further to discover what the role of particular calls are, if it is even known. It is curious why these calls are paired, and why at times the bird would switch to a pair of the same call note (figure 2). Figure 2. Paired call of Evening Grosbeak, both as sweep Type 1 calls. This paired call was less common than the pair seen in figure 2 for the individual calling. I’ve been learning quite a bit about bioacoustics, the role of sound in nature, and how to properly analyze sounds using particular software. I decided to take on this objective to test my ability to go into the field, find my subject, get a proper recording, look at the sound using software, produce spectrograms, and communicate ideas. I “failed” at my objective of finding my target subject, but in doing so I stumbled upon something that taught me quite a bit. I’m happy about that, as it is a lesson in making an effort. Inevitably there is always something to gain. 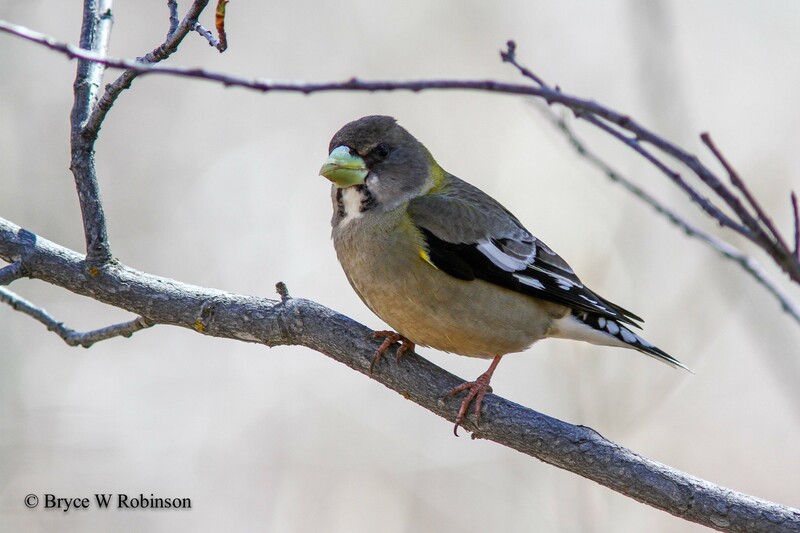 Perhaps one of the most important discoveries that came from recording the grosbeaks was finding an eBird article discussing one Ph.D. students aspirations to catalogue the different types of calls, where the true boundaries are, and how much intermixing happens between individuals where type boundaries occur. The students name is Aaron N. K. Haiman at University of California, Davis. He has requested that anyone and everyone record call notes of Evening Grosbeaks and share with him. So, I’ll be sending him my recordings along with the information on location, time of day, etc. to give the recording context. All in all, I’d say I had a Saturday well spent. Once again, your storytelling from your birding pursuits is lovely. Appreciate the spectrogram. We should talk song analysis software. I’ve been listening to a lot of our recordings from the Seward Peninsula thinking of ways technology might differentiate dialects there. OOH. Interest peaked. I can talk sound analysis with you! Let’s make a plan to make some time to talk some analysis over an ice cold stout at the AP. Hi Aaron. We live in Crestline up in the San Bernardino mountains in California. 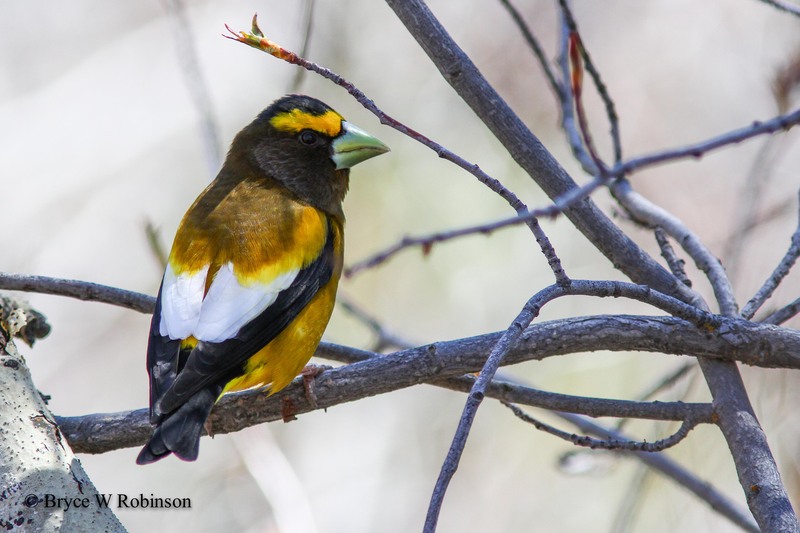 We just had a visit from a bird looking just like the Evening Grosbeak. We have a lot of Black-Headed Grosbeak but this one was different with it’s yellow head and large white patches on the wings on his back. If you want to see some pictures, let me know and I can email them to you.